The Copper and Lumber Store Historic Inn was built in 1789 to house the materials for repairing and maintaining the wooden sailing ships of the Royal Navy. The building was an addition to the already thriving Naval Dockyard, which was later renamed Nelson's Dockyard in honor of famed Vice-Admiral Horatio Nelson. In 1951, a group of preservationists, The Society of the Friends of the English Harbour, began to restore the Dockyard. That project would eventually become part of Nelson’s Dockyard National Park, a UNESCO World Heritage Site and the largest of Antigua’s National Parks. The restoration of the Copper and Lumber Store Historic Inn was completed in 1988, with all fourteen guestrooms located within the historic structure. 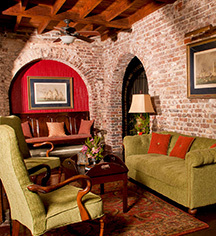 The Georgian-style decorated studios and suites offer antique furnishings, wood-beamed ceilings, and exposed stone and brick. Amenities include air-conditioning, flat-screen televisions, a kitchenette, and private bath. 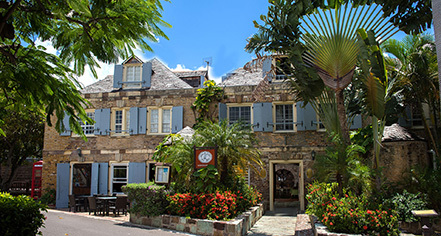 The courtyard restaurant serves Caribbean cuisine and seafood, with gorgeous views of the Dockyard. The 18th century Copper and Lumber Store Historic Inn is near Nelson’s Dockyard National Park, a UNESCO World Heritage Site, the Dockyard Museum, and The Pillars of Hercules. The inn overlooks the English Harbour and is located 3.4 km from Galleon Beach, 1.4 km from Pigeon Point Beach, and 22 km from V. C. Bird International Airport. Each of the fourteen guestrooms are named after one of Vice-Admiral Nelson's ships or the Commanders that served with him. The Copper and Lumber Store Historic Inn was built in 1789 to house the materials for repairing and maintaining the wooden sailing ships of the Royal Navy. The building was an addition to the already thriving Naval Dockyard, which was later renamed Nelson's Dockyard in honor of famed Vice-Admiral Horatio Nelson. Learn more about the History of Copper and Lumber Store Historic Inn .